Optimal workflow, cost, and performance for your pharmacy printing applications. 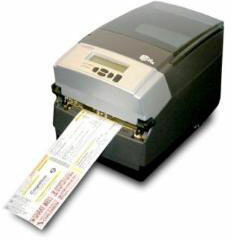 The CognitiveTPG CRx generates prescription labels fast and saves money on energy and supplies. The simple media path prevents label jams and ensures long-lasting performance. Because the CRx is a thermal printer, no messy or expensive toner is required and it utilizes far less energy than a laser printer (a ratio of 10: 1 energy consumption). The CRx small footprint, high-performance printer allows pharmacists to manage multiple stations for on-demand printing at all stages in the workflow process, including receiving, validation & verification, fulfillment, storing & delivery, prescription labeling, and patient education forms/compliant prescription monographs. Print up to 4.153" wide, 300 DPI standard, 16 MB SDRAM, 8 MB flash, adjustable transmissive & reflective index sensors, thermal transfer. Prescription Labels: tags, wristbands, patient education, static labels, fanfold, receipt paper. Connections: Ethernet, USB-B, USB-A, Serial/Parallel (serial and parallel port require unique cable for use). Print up to 2.205" wide, 300 DPI standard, 16 MB SDRAM, 8 MB flash, adjustable transmissive & reflective index sensors, direct thermal. Prescription Labels: tags, wristbands, patient education, static labels, fanfold, receipt paper. Connections: Ethernet, USB-B, USB-A, Serial/Parallel (serial and parallel port require unique cable for use). Print up to 2.205" wide, 300 DPI standard, 16 MB SDRAM, 8 MB flash, adjustable transmissive & reflective index sensors, thermal, LCD included. Prescription Labels: tags, wristbands, patient education, static labels, fanfold, receipt paper. Connections: Ethernet, USB-B, USB-A, Serial/Parallel (serial and parallel port require unique cable for use). Print up to 2.205" wide, 300 DPI standard, 16 MB SDRAM, 8 MB flash, adjustable transmissive & reflective index sensors, thermal transfer, LCD included. Prescription Labels: tags, wristbands, patient education, static labels, fanfold, receipt paper. Connections: Ethernet, USB-B, USB-A, Serial/Parallel (serial and parallel port require unique cable for use).